When Murry Wilson, the father of Brian, Carl, and Dennis Wilson, was fired as their producer, he set out to prove that their success was due to his genius. He became the manager of the The Sunrays. They actually were a very good surf band who had a couple of moderately successful hits. 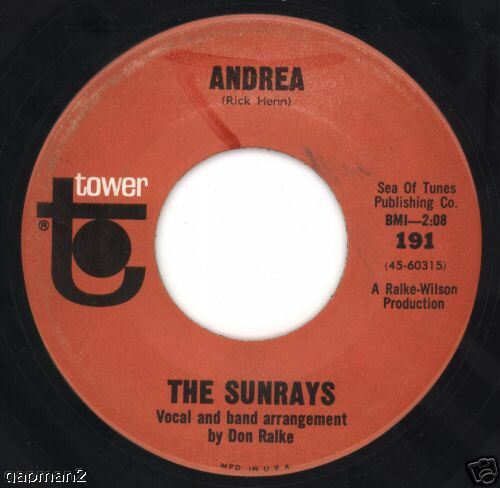 Their most memorable song was “I Live For The Sun” but it was “Andrea” that charted the highest. Released Jan. 26, 1966, it climbeed to number 41 on the BILLBOARD MAGAZINE Pop Singles Chart . What the band really had going for it was the wonderful lead vocal of Rick Henn who should have gone on to stardom. Dickey Lee has had three phases to his career. He is best remembered as a pop singer who produced such songs of anguish as “Patches” and “Laurie” during the early to mid-1960s. He would go on to become a country artist who charted 29 singles. What people forget was he started as a rockabilly artist on the legendary Sun label, which was the home of Elvis Presley, Roy Orbison, Johnny Cash, Jerry Lee lewis and others. He signed with the label during 1957 and I’m sort of amazed he had a release issued as a 78. I am assuming it was also issued as a 45 as 78’s were on the way out at the time. 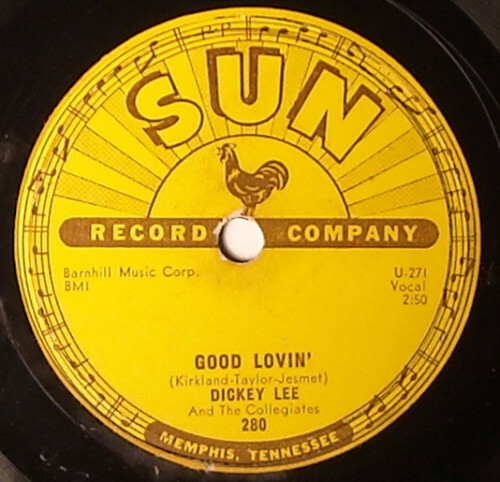 “Good Lovin'” did not receive any chart action and his time with Sun was brief. Still, it was a part of some of the best music of his career. Alberta Hunter is an often forgotten gem of American music. Born in 1895 in Memphis, Tennessee, she was a rare female star of the early 1920s and 1930s blues movement. During 1922 she wrote “Downhearted Blues,” which became one of Bessie Smith’s biggest hits. Her own recording career began in 1921 and lasted until just after World War II. She toured Europe a number of times and performed on Broadway. In addition, she was a member of the USO. and entertained American troops during the Second World War and in Korea. Her career finally ran its course during the 1950s, so she faked her age, faked a high school diploma, and became a nurse at the age of 62. She was forced to retire at the age of 79 in 1974. Out of boredom she resurrected her singing career after she turned 80. She first performed at The Cookery Club in Greenwich Village while in her early 80s during 1977. The live recordings that make up Downhearted Blues: Live At The Cookery were taken from one of her performances at that club. It was the place and time where she re-introduced herself to a new generation of fans. She would continue to perform until just before her death at the age of 89. She stripped the music to basics. She was backed only by pianist Gerald Cook and bassist Jimmy Lewis. For an octogenarian her voice remained a supple and strong instrument, which enabled the focus of the music to shine on her interpretations of the lyrics. The songs ranged from straight blues to the great American songbook to everything in between. Her own “Downhearted Blues” and “I’ve Got A Mind To Ramble” recalled the blues style of her younger days. “I’ve Got Rhythm” is presented in a swing style similar to Ella Fitzgerald. “Two-Fisted Double-Jointed Rough And Ready Man” and “You Can’t Tell The Difference After Dark” contained sexual innuendo, which was all the more amusing given her age. “Old Fashioned Love” is a simple and beautiful song of a person in her 80s looking back at life. Her music and style was made for the intimate setting of The Cookery Club. The 18 tracks, which cover just over 70 minutes of music, fly by courtesy of an old master. Downhearted Blues: Live At The Cookery is a lasting look at the talent and style of an old blues legend. So settle back, put your feet up, and enjoy the regal presence of Alberta Hunter. Article first published as <a href=’http://blogcritics.org/music/article/music-review-alberta-hunter-downhearted-blues/’>Music Review: Alberta Hunter – <i>Downhearted Blues: Live At The Cookery</i></a> on Blogcritics. Stevie Wonder released Conversation Peace March 21, 1995. It would be 10 years until he released his next studio album, A Time To Love, which remains his last to date. It is an album that should be taken on its own merits. Stevie Wonder was not the same artist as during his classic 1970s period, just as he was far removed from his early 1960s material. It represented the modern Stevie Wonder and that will do very nicely. A Time To Love was a strong and solid album. It may not have had an outstanding or truly memorable song, but everything merged together into a pleasant and cohesive whole. There were love songs and lyrics of social awareness. There were ballads and mid-tempo soul tunes. Through it all his musicianship and production expertise helped to form a slick and polished release. He continued to play many of the instruments and compose all the material. He co-opted a number of guest stars to provide support including Prince, Paul McCartney, En Vogue, Bonnie Raitt, Kim Burrell, Kirk Franklin, and Hubert Laws. The best song, and certainly the most poignant, was “How Will I Know,” which featured his daughter Aisha Morris. This jazzy love ballad brought the affection for his daughter full circle. It began with the 1976 song, “Isn’t She Lovely,” which celebrated her birth from the year before (1975). Close behind was another Aisha collaboration, “Positivity,” which was a fun-filled, feel-good romp. The biggest production was “So What’s The Fuss,” with Prince on guitar and backing vocals by En Vogue. The other major star-turn was the guitar work by Paul McCartney on the title song. Stevie Wonder has aged well and continues to make it look all so easy. As his career moves on toward the 50-year mark, his music remains accomplished, relevant, and enjoyable. A Time To Love is a fine representation of his 21st century mind and music. Article first published as Music Review: Stevie Wonder – A Time To Love on Blogcritics. Paul Kelly may not be a household name in the United States but in his native Australia, he is a popular and revered singer/songwriter. He was born in Adelaide, South Australia during 1955, but by the mid-1970s had settled in Melbourne and become active in the music scene. His first group, The Dots, established him as a recording artist. He moved to Sydney during 1985 and formed Paul Kelley and The Colored Girls before changing the name to The Messengers. By the end of the decade he had begun his solo career which continues to the present day. Rolling Stone Magazine’s David Fricke has called Kelly “one of the finest songwriters I have ever heard, Australian or otherwise.” This is an apt description of his talent. While his music is well-structured and melodic and his voice may be a distinctive but somewhat acquired taste, it is as a lyricist that has enabled him to become the virtual poet laureate of Australia. His songs are capsules that capture situations and moments in time. They present his life experiences and memories and expand outward into an Australian roots style that deals with death, love, aborigines, struggles, and just getting by. The messages and pictures he paints are not just confined to his home country but are eternal odes to life that can be adopted by many countries and situations. Kelly’s music is now being re-introduced in the United States. His Greatest Hits – Songs From The South Volumes 1 & 2 was originally issued in Australia in two parts, the first in 1997 and the second during 2008. They have now been combined into a two-CD set and will be released in digital form, September 6, and in a physical version, October 25. The 40 songs span his career and are an excellent overview of his music. The material contained here represents his best known and popular songs, many of which have never been available in North America. His style can best be described as folk/rock, although he branches out into country, bluegrass, and even a reggae sound once in a while. It all adds up to a somewhat disjointed affair musically but when the tracks are taken individually, they shine brightly. In spanning his entire recording career, Greatest Hits – Songs From The South Volumes 1 & 2 demonstrates that he is an adventurous and compelling musician. His songs are fresh, inspired, and addictive. This album and his music are well worth exploring. Article first published as Music Review: Paul Kelly – Paul Kelly’s Greatest Hits – Songs From The South Volumes 1 & 2 on Blogcritics. 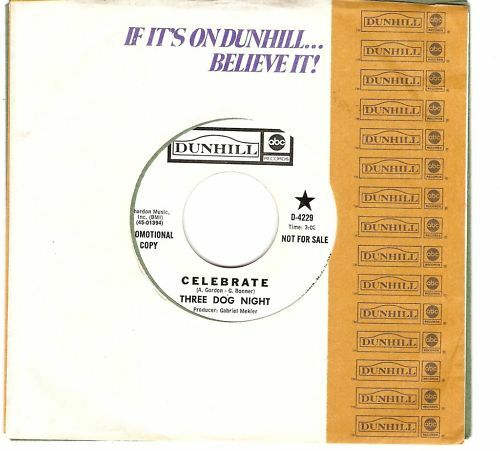 Three Dog Night may have sold millions of albums but they will always be known as a singles band. They produced some of the most memorable and best singles of the late-1960s to mid-1970’s. Their number one hits, “Mama Told Me Not To Come,” “Joy To The World,””Black and White,” plus eight others that made the top ten are eched into the American music consciousness. The key to their success was the catchy hooks that stayed with you long after the song ended. “Celebrate” was one of those songs. It continued to build until it reached the repeating Celebrate chorus. Released Feb. 28, 1970, it reached number 15 on the BILLBOARD MAGAZINE Pop Singles Chart. It is still a great listen over 40 years later. Harry James is a sometimes somewhat forgotten superstar of the big band era. The same can be said for singer Helen Forrest. Both would continue to perform until near their deaths in 1983 and 1999. respectively. Harry James could coax some of the purest sounds from his trumpet as you will ever hear. Likewise, Helen Forrest had a beautiful and clear soprano voice. “I’v Heard That Song Before” began like many of Harry James’ releases. First it was his trumpet soaring above the mix and then during the second half of the song, it was Helen’s voice taking over. The song reached number one March 6, 1943 and became one of the biggest hits of the decade. It remained in the number one position for 12 weeks, fell out ot that position, and then returned for one more week for a grand total of 13 weeks on top of the music world. You are currently browsing the Muskmellon's Blog blog archives for August, 2011.